A recent interaction highlights the burgeoning security ties between the two countries. As was noted in these pages earlier this week, India and Singapore have just completed their annual joint army exercise, called “Bold Kurukshetra 2019.” The recent bilateral military exercise is a reflection of the growing strategic proximity between India and Singapore in the face of a series of challenges, including a growing and muscular China. Singapore has remained one of India’s major security partners in Southeast Asia. The two countries signed their first Defense Cooperation Agreement in October 2003 and a separate memorandum of understanding on joint army exercises in 2005. The two then signed several more agreements for accelerating the pace of military-to-military relations in 2007 and 2008. These agreements have been reviewed and renewed periodically, maintaining their commitment to developing a habit of cooperation between the two countries’ armed forces. Given Singapore’s territorial limitations, India has also opened its own military training facilities, such as the air force and artillery firing ranges, to the Singapore Armed Forces. Besides, the Indian and Singapore navies have been engaged in the annual naval exercise series called SIMBEX for more than two decades. In fact, the two countries celebrated the silver jubilee of their naval exercises last year with major displays of “multidimensional drills,” which saw the participation of many different types of ships and aircraft from India and Singapore. Starting in 2015, the two countries have also held three editions of the Defense Ministers’ Dialogue, the last of which was held in November 2018. The third edition of this Dialogue had both the defense ministers appreciating the conclusion of the Navy Implementing Arrangement Concerning Mutual Coordination, Logistics and Services Support in June 2018. This, along with the Navy Bilateral Agreement signed in November 2017, broadened and deepened India-Singapore bilateral naval cooperation, taking the relationship higher. They are also manifestations of the broader focus by both sides on maritime security, as evidenced by other developments as well such as a technical agreement on the sharing of white shipping information and advancing coast guard collaboration. Highlighting the significance of maritime security, Indian Prime Minister Narendra Modi had stated during the ASEAN India Commemorative Summit, “We remain committed to work with ASEAN to enhance our practical cooperation in our shared maritime domain.” He said India is particularly interested in pursuing cooperation on disaster risk reduction and management, joint patrols and exercises, and maritime capacity building. 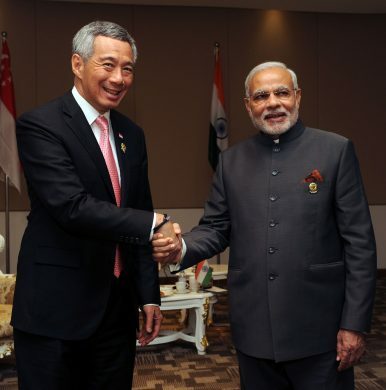 India-Singapore engagements have gotten a lot stronger in recent years. Certainly, Modi has infused more traction into this relationship as part of his strengthened outreach to Southeast Asia with the Act East Policy. And there are upcoming developments that will showcase this as well, including reports that India is planning a new trilateral maritime exercise in the Andaman Sea with Singapore and Thailand later in the year. The broader convergence of strategic interests between India and Singapore is clearly the driving factor for these engagements. At the Defense Ministers’ Dialogue, both sides have repeatedly emphasized “the importance of maintaining freedom of navigation and overflight consistent with international law, including the United Nations Convention on the Law of the Sea.” Further, while reiterating the importance of international law, they have articulated the need to resolve disputes through peaceful means. On the issue of deepening defense technology collaboration, India and Singapore have a set up a bilateral Defense Technology Steering Committee as well as the India-Singapore Defense Industry Working Group and they are reported to be making good progress. Areas of cooperation include Combat Care and Vehicle Armor. The growing economic muscle and military posturing by China provides an important rationale for India and Singapore to strengthen their bilateral relations. Irrespective of the results of the current Indian national elections, which are expected in late May, it is likely that India-Singapore ties would deepen and that Singapore will remain an important priority for India’s outreach to Southeast Asia. Security relations in the spotlight as the two sides hold their second defense ministers’ dialogue.